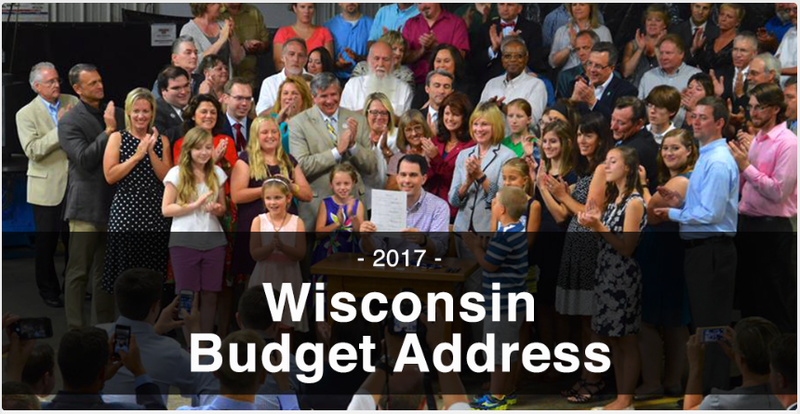 On Wednesday, February 8th, Wisconsin Governor Scott Walker issued his Executive Budget for 2017 thru 2019. Below, we list the clean energy related provisions that RENEW has found in the document. If more items or information is identified, we will add it as we become aware. From a process perspective, the Budget will head to the Legislature's Joint Finance Committee, where hearings will be held throughout the spring. The full Legislature will vote on the Budget in early summer. 1) The "Executive Budget" located here. 2) The "Budget in Brief" located here. Please email Tyler if any of these items are of particular importance to you or your business. We are continuing to gather information about these items and appreciate your input. The Governor has proposed segmenting the $5,237,700 annually spent for state agencies to purchase renewable energy. Currently, the Department of Administration handles these purchases, and the Governor has proposed that the agencies involved should instead have their own budgets to make these purchases. These agencies include Departments of Corrections, Health Services, Public Instruction, Veterans Affairs, and University of Wisconsin System. The Governor has proposed to prohibit any new increases in school district revenue limits for energy efficiency and renewable energy projects. School districts would still have the ability to use referenda for these projects. Commonly referred to as "Act 32" in the energy circle, this provision allows school districts to spend money above their revenue limits if the funds are spent on qualified energy efficiency and renewable energy improvements that reduce energy and operational expenditures. The "Budget in Brief" frames this in the following way: "Mitigate property tax increases by eliminating the energy efficiency exemption in revenue limits on a going-forward basis. Property tax levies associated with the exemption grew 115 percent in last three years and in calendar year 2016 alone, districts obtained authorization to spend $327,052,400 above revenue caps. School districts will continue to have the ability to use referenda for these projects." In what may be seen as a trade-off, the Governor has proposed that up to $10 million of Focus on Energy's annual budget for each year be spent on schools energy efficiency. The "Budget in Brief" describes this further: "Allocate up to an additional $10,000,000 from Focus on Energy funds annually or up to $20,000,000 over the biennium for elementary, secondary, and postsecondary schools in the Focus on Energy program for energy efficiency projects, and prioritize the funding to public elementary and secondary schools." This is a budget for organizations such as RENEW Wisconsin, Citizens Utility Board, and others to utilize and bring expert witnesses and legal support to cases at the Public Service Commission. Cases may include utility rate cases, the construction of new power plants or transmission lines, and additional proceedings. The Governor has proposed to allocate an $742,500 annually for both years of this budget. This line item was cut to from over $1 million annually down to $371,000 per year in the previous state budget. Adding funds for intervenor compensation is a good thing to ensure complete cases and evidence are presented to the Commission for their decision-making. "Through the class action settlement resulting from Volkswagen, settlement funds received by the state will be redirected to replacing aging, inefficient vehicles with clean-powered vehicles, ensuring additional protections of the state's air quality." The Governor proposes to "allocate $42,000,000 of Volkswagen emissions settlement funds expected to be received by the state in the 2017-19 biennium for the replacement of older vehicles with new, lower emission vehicles. Through consultation with Milwaukee County, the state will provide up to $26,000,000 of the settlement funds to the county to purchase new buses during the 2017-19 biennial budget. This will lower transit system emissions and target a majority of settlement funds toward a region deemed to be in need of air quality improvement. In return, the county will repay the state $1,950,000 per year for a ten-year period. The remaining $16,000,000 available during the 2017-19 biennium will be used to replace state-owned vehicles. " "Adopt state version of federal REINS Act by requiring the Legislature to approve all administrative regulations that have an impact of $10,000,000 or more on regulated individuals and entities. Provide for greater transparency of an administrative rule's potential impact on businesses, local governmental units, and individuals by requiring, at Joint Committee Review of Administrative Rules' (JCRAR) request, a preliminary hearing and comment period to allow for stakeholder feedback earlier in the process. In addition, allow an independent economic impact analysis of regulations at the request of Department of Administration or JCRAR. Provide a process for agencies to follow regarding guidance documents to ensure that public comment is considered. Additional modifications to the process include: require Department of Administration approval of economic impact analyses, changes to emergency rule extensions, an expedited process for repealing unauthorized rules, and sunset of rule-making authority for agencies that have not promulgated a rule in ten years or more." 49.175 (1) (i) Emergency assistance. For emergency assistance under s. 49.138 and for transfer to the department of administration for low-income energy or weatherization assistance programs, $7,000,000 in each fiscal year (down from $8,500,000 in 2015-16 and $8,400,000 in fiscal year 2016-17). The Governor recommends eliminating the Bioenergy Council, which last met prior to September 15, 2015. The Bioenergy Council was under the Department of Agriculture, Trade, and Consumer Protection. Repeal the prevailing wage requirements for state construction projects. This is listed under a set of "Government Reforms" in the budget in brief, and called out in the executive summary of the full budget document. June 30, 2020, for savings of $1,000,000 SEG in fiscal year 2017-18 and $1,077,100 SEG, including 1.0 FTE position, in fiscal year 2018-19 or $2,077,100 SEG and 1.0 FTE position over the biennium. Provide $825,000 SEG (segregated revenue) in fiscal year 2017-18 and $825,000 SEG in fiscal year 2018-19 for additional support in order to fully fund demand for cost- sharing nonpoint source abatement projects and other land and water conservation activities performed by counties. Total funding for the program will be set at $3,325,000 SEG, an increase of 24 percent over base level funding. Direct the Department of Agriculture, Trade and Consumer Protection, and the Department of Natural Resources to conduct a study on the feasibility of transferring the permitting process for concentrated animal feeding operations from the Department of Natural Resources to the Department of Agriculture, Trade and Consumer Protection. Eliminate the stray voltage program administered by the Public Service Commission and the Department of Agriculture, Trade and Consumer Protection, providing annual savings of $305,100 PR (program revenue), a reduction of 1.0 FTE position to the commission and a reduction of 5.0 FTE positions to the department. The sunset of the program also saves rural cooperatives over $25,000 annually through the elimination of fees. No claims have been awarded under the program for many years.